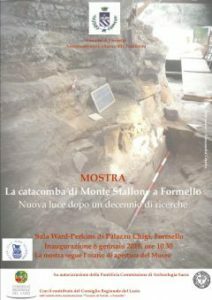 The exhibit, "La Catacomba di Monte Stallone a Formello, nuova luce dopo un decennio di ricerche", is on display from January 6, 2018 at the Museo dell'Agro Veientano in Palazzo Chigi, Formello (RM). Sponsors of the show include the Consiglio Regionale del Lazio and the Pontificia Commissione di Archeologia Sacra. The catacomb in the province of Rome dates from the 4th and 5th centuries CE and is excavated into a hillside, the so-called "Monte Stallone", from which it derives its modern name. 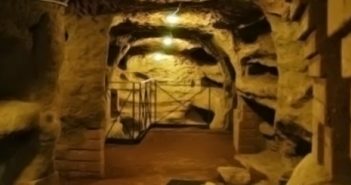 It exists today on one level only, as five galleries and one chamber, with a predominance of loculus tombs. The British School at Rome first came across the site in the 1960's: more recently, it has been studied and restored by the Pontifical Commission for Sacred Archaeology under the direction of Prof. Vincenzo Fiocchi Nicolai, Archeological Inspector for the Catacombs of the Lazio and Abruzzo Regions.